Halifax will go into next weekend’s crucial Championship fixture at Dewsbury (3.0) looking to open up a three-point lead over the Rams. 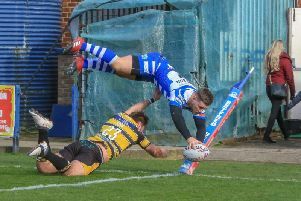 Glenn Morrison’s side went down 22-18 to Bradford on Sunday, leaving them a point behind ahead of the meeting at the Tetley’s Stadium. Fax start the week in the coveted fourth spot, ahead of London and Featherstone on points difference, although Rovers still have a game in hand. Fax are expected to release more details of their re-arranged home fixture against the Broncos - which has been brought forward to Saturday, June 27 at Cougar Park, Keighley (6.0) because of delays in completing work on the Shay pitch - early this week.